A New Kind Of Perfect - Introducing: Trilogy Rosehip Oil Antioxidant+Better Repair. Greater Protection. New from Trilogy, the Rosehip oil experts. Ten Beautiful Years after introducing the world to the wonders of Rosehip oil, Trilogy is launching the latest advance in natural beauty: Rosehip Oil Antioxidant+, a product set to redefine high performance natural skincare. Certified organic and 100% natural, Rosehip Oil Antioxidant+ combines nature’s most powerful skin restoring and protecting properties in a unique and advanced formulation (Rosapene™). With all the benefits of our award-winning Certified Organic Rosehip Oil, plus the addition of red berry super antioxidants, Rosehip Oil Antioxidant+ represents a new level of innovation for natural skincare. This carefully selected seed oil blend works synergistically, delivering intensive nourishment to replenish softness and elasticity as well as daily antioxidant protection for healthier, younger looking skin. Potent super antioxidants Lycopene from Tomato and Phytosterol from Acai help protect from premature ageing caused by environmental free radical damage. Nourishing Essential Fatty Acids (omegas 3 and 6) from Cranberry and Rosehip moisturise and renew. Mineral and vitamin rich Oat extract provides a soothing and luxurious feel that glides on the skin. Rosehip Oil Antioxidant+ is the ‘everything-your-skin-needs’ beauty oil, helping to repair yesterday’s damage and protect from tomorrow’s. Extracted from the seeds of organically grown Rosehips, Rosehip seed oil has high levels of Essential Fatty Acids (omegas 3 and 6) which help to repair, strengthen and hydrate the skin. Our in-house manufacturing expertise ensures the finest quality oil with guaranteed minimum 80% essential fatty acid content. 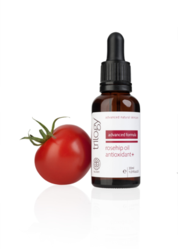 Cold pressed Tomato seed oil has a minimum 80% lycopene content, one of nature’s most powerful antioxidants, to help protect the skin against oxidative damage and premature ageing. Cold pressed oil from Cranberry seeds is high in Essential Fatty Acids (omega 3 and 6) – see above for benefits. Extracted from the seeds of the Acai berry (pronounced ah-sih-ee), this oil is a skin-conditioning emollient rich in antioxidant phytosterol as well as omegas 3, 6 and 9. It is known to nourish the lipid barrier and stimulate the regeneration process, encouraging new collagen production. Sourced from Finland and hardened against the extreme climate, this oat extract is enriched with the perfect combination of essential nutrients including omegas 3 and 9 and vitamins A and E.
For stockist information, visit trilogyproducts.com.